These photographs were taken, with one exception, all over Europe between 1979 and 2001. After that year, I went fully digital. There is something about the look of film that I miss, but not enough to return to it. My first trip was in 1979 and I took something like 1500 photographs, about five of which I would ever show anyone. They were just badly made. One is included here, and it's not very good either. But these film photos do bring back a lot of memories of great trips, none of which were taken specifically to do photography. As a result, I was faced with occasional bad light which I had to make do with. I was faced with tour groups deciding my itinerary, and I was faced with fatigue by trying to squeeze too much into too few hours. My wife and I led student tours of Europe for a number of years and, as a result, we got to go on freebie winter trips to Paris (4 times) which were 4 day jaunts at Thanksgiving or on the MLK holidays. Paris in the winter is nothing like it is in the summer when we have school break, and I got some of my best photography done not having to worry about chaperoning teenagers. Hectic but always worth the jet lag. The student trips were more of the "If this is Tuesday, it must be Belgium" variety. We later branched out into adult trips and these were far more relaxing and more like real travel. 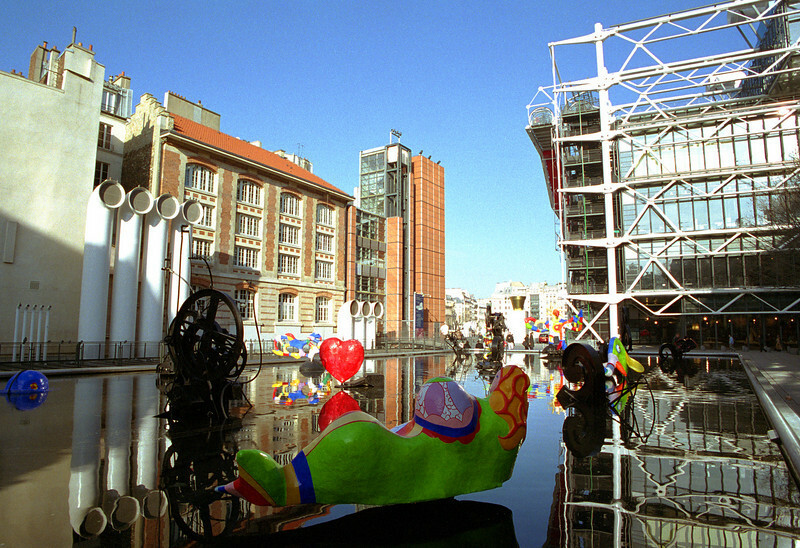 Beauborg, Paris, France, 2002. Modern sculpture next to the most controversial architecture in Paris.